NO BAD HAIR DAYS: We groom every kind of dog from champions and show dogs to mixed breeds. All the dogs that come here are treated the same and loved the same. If its canine, its welcome here. Deborah Frame-Bealer, owner of Fantasias Grooming Salon, is shown with her 3-year-old bearded collie, Joanna. The care and well-being of dogs is Deborah Frame-Bealers mission. 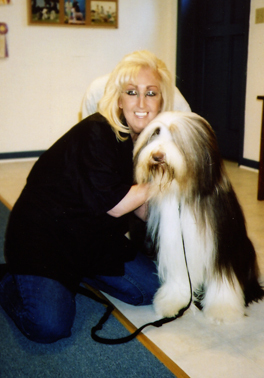 A breeder, trainer, animal behaviorist, animal nutritionist, and master groomer, she has also trained drug-sniffing dogs and dogs for the deaf. She and her husband, Randy Bealer opened Fantasias Grooming Salon in October. Located at 4595 Main Street, Route 27 in Kingston, this is the latest of several salons Ms. Graham-Bealer has owned or been involved with. DINING OUT: Were set apart by our style. Our theory is that presentation is very important, and ours is very colorful. 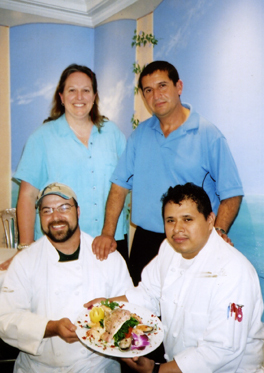 When the food is served, you eat it with your eyes first! The staff at the Calico Grill includes, back row, from left: owner Marguerite Heap, general manager Carlos Espichan; front row, from left: owner Alan Heap, sous chef Juan Cifuentes. In the foreground is a featured seafood platter, with red snapper, New Zealand mussels, and sauteed jumbo prawns over broccoli rabe and mashed yucca potatoes. The hot new restaurant in town is almost hidden away. But once diners find it, they are sure to return. Opened in August, the Calico Grill is located down the alley behind Coxs Market, at 180 Nassau Street.